Live at the Roxy comprises the live tracks from the three-quarters live Indian Summer LP. If you want the studio tracks from Indian Summer on CD, you have two choices, and they're both 24 Carrots. The U.S. Razor and Tie edition of 24 Carrots gives you three bonus tracks ("Indian Summer," "Pandora" and "Here in Angola"), while the U.K. EMI release has all five (adding "Delia's Gone and ""Princess Olivia"). Unfortunately, both versions of 24 Carrots are long out of print and can get pretty pricey. Al Stewart recorded some truly great studio albums during the 1970s, but he was and is at his best live. 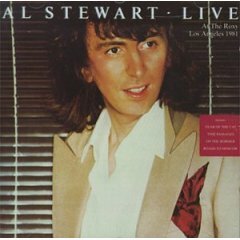 And Live at the Roxy contains excellent live versions of all of Al Stewart's commercial hits plus a few others that didn't get played on the radio, but are nonetheless fine songs. The quality of the recordings is excellent and the performances are very lively and tend to surpass the original studio versions. "Running Man," "Soho (Needless to Say)," and "Roads to Moscow" are real standouts in this area. The only flaw in this otherwise impeccable album is "Clarence Frogman Henry," which is a bit of a shaggy dog story that gives a bit of the flavor of the between-songs banter at Stewart's concerts, but unlike the songs, once you've heard it once, it ceases to be of any interest. But it's short and easy to skip, and the rest of the album is superb.